My name is Daley Clarke and I am 26 years old. I’ve been working in the golf course industry for about 7-8 years. I completed my apprenticeship at Club Banora Golf Course which is a 9 hole golf course located 5 minutes from the NSW/QLD border. I completed Sports Turf Management III at Wollongbar TAFE. I got this opportunity through The Ohio State University. The Ohio Program allows me to do an internship at a Top 100 Golf course in The United States. 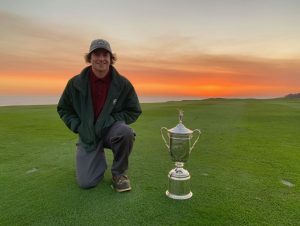 I was luckily enough to get the opportunity to do my internship at Pebble Beach Golf Links, special thanks to Mike O’Keefe. I’d also like to thank the Australian Golfing Fellowship of Rotarians for awarding me the John Hood Memorial Scholarship which helped me financially to get over here. 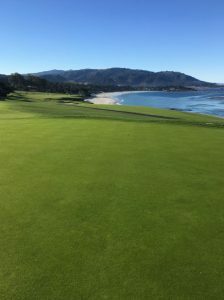 First impressions of Pebble Beach. I was very nervous and didn’t know what to expect. It was surreal coming from a small 9 hole golf course with a crew of 4 to one of the most famous golf course’s in the world. The views are breathtaking; photos don’t do the golf course justice. The Superintendent, Assistant’s and the rest of the crew of 30 plus were all welcoming and friendly, which made it a lot easier for me to settle in. I was on the Greens section for my first 4 months and I was on “Section 1” which includes holes 1, 5, 9, 13 and 17. All those holes besides number 1 had views of the ocean. Every morning my duties were to clean and mow the green, hand rake bunkers, fix ball marks, trim greens and green surrounds sprinkler heads and spot water green surrounds. 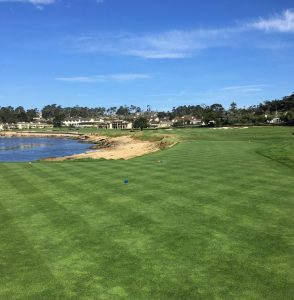 I had only used a walk behind greens mower a handful of times and now I was using one at Pebble beach, it was all pretty overwhelming. I learnt different techniques with multiple different rakes on how to rake bunkers, for a smooth, flat finished look. I also learnt the attention to detail, for example: trimming sprinkler heads with scissors. 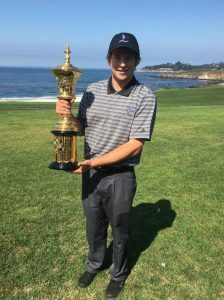 In August, Pebble Beach hosted the US Amateur Open, which is the leading annual golf tournament for the best amateur players in the world. It was a massive first tournament for me to work in and my job was to mow the front 9 greens. It was a long tournament, which consisted of 7 days. 2 days of stroke play then the top 64 players play match play format until the last day. It was broadcast on National television; it was rewarding seeing all the hard work over the months of preparation on television. After the US Amateur I started doing all different types of tasks: Mowing fairways, Tees, collars and approaches, rough, trimming bunkers. In September Pebble hosted the Concours d’Elegance which is an event where prestigious vehicles are displayed and judged. The event shuts down the golf course, where cars are displayed up and down the famous 18th fairway. approaches during the event. It had a lot of responsibility as I had to burn in the mowing direction lines, which were straight up and down. In November there was the Taylormade Pebble Beach Invitational. It’s the worlds only tournament that pits players from the PGA, LPGA, Champions and Web.com Tours against each other. 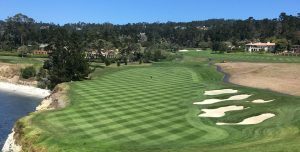 It was played over the Pebble Beach Company owned golf courses, Pebble Beach Golf Links, Spyglass Hill and Spanish Bay Golf Links. For that tournament I helped at Spanish Bay Golf Links. Spot watering fairways, bombing sand divots etc. Cool season grasses, Poa, rye and fescues. compared to home that is predominately couch grass. Majority of the crew are Hispanic, so can be hard to communicate sometimes, but also fun learning some Spanish. The weather, the temperature is always pretty mild which is perfect conditions to work in. During the summer the Monterey area is taken over by fog, but it plays a vital role for the local ecosystem during the drought months. Outside of work I have played rounds at world class golf courses. 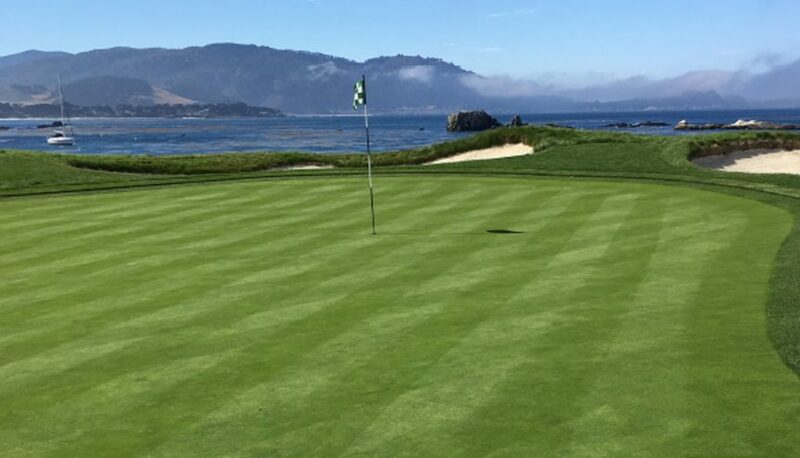 I have played Pebble Beach, Spyglass Hill, Spanish Bay, Poppy Hills and Pasatiempo. I’ve also attended multiple major sporting events which include NBA Finals, NFL, College Football and a World Surfing League event. I’ve been here for 7 months and have already learnt and experienced so much. I have made some good friends and had some experiences that I never would have if I stayed in Australia. Over the next 7 months I have the AT&T Pebble Beach Pro Am in February and The US Open in June to look forward to.